In Melkote there are two important temples. The Cheluvanarayanaswamy Temple is one of the most ornate temple located in the center of the town. The temple complex has a main unit consisting of a Garbhagraha and an Ardhamandapa, a narrow pillared corridor, a Mahamandapa and a small Mukhmandapa. There is a large courtyard surrounded by a prakara wall with a broad pillared closures on its inner and outer sides. 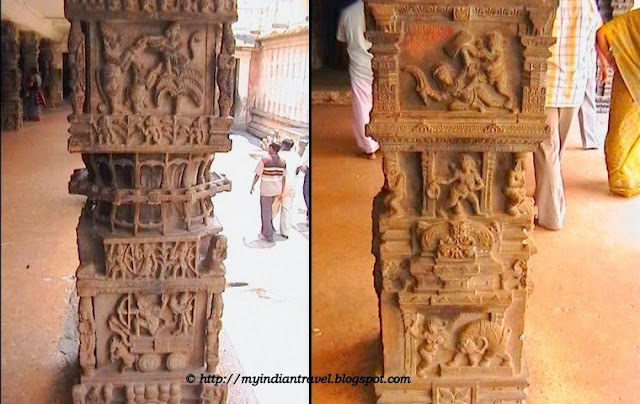 In the narrow pillared corridor, the pillars are carved beautifully. The carvings on the pillar are very unique. No two pillars of the corridor are identical. The uniqueness of the each of pillars can be seen in the above snap. The timings at the temple are, 9.00am to 1.00pm and 5.30pm to 8.00pm. During Saturdays, Sundays and public holidays, the timings will be from 11.00am to 2.00pm and 5.00pm to 8.00pm. Note Photography is strictly prohibited inside the temples but people can carry their cameras along with them. Wonderful temple with amazing carvings. Great shots! I cannot get enough of the architecture. Belas e fantásticas fotografias, gostei. Beautiful pics. loved this post.